where the next model of the Volkswagen Crafter will be built starting in the second half of 2016. Dr. Leif Ostling, Member of the Board of Management of Volkswagen AG with responsibility for Commercial Vehicles, Dr. Eckhard Scholz, Chairman of the Board of Management of the Volkswagen Commercial Vehicles Brand and Jens Ocksen, Head of the Board of Management of Volkswagen Poznan, welcomed more than 200 guests to the event. Among the guests who attended were Janusz Piechocinski, Deputy Prime Minister and Minister for Economic Affairs of Poland, Marek Wozniak, Marshal of the Wielkopolska Voivodeship and his Excellency Archbishop Dr. Stanisław Gadecki. The signed articles of association sealed in a 'time capsule' were immured together with the foundation stone. "As a result of this investment the work force of the Volkswagen Group in Poland will grow to over 16,000 employees in the next few years. This will increase the importance of Poland as an international automobile location," said Dr. Leif Ostling. The new plant will be built at Wrzesnia about 50 kilometres east of Poznan. The building site covers an area of 220 hectares, which is equivalent to a size of over 300 football fields. At present, the first construction work is under way to level and pave the site. The first vehicles will leave the assembly line in 2016. "Today, we produce around 170,000 vehicles with almost 7,000 workers not only for Poland but for the whole of Europe and beyond," said Dr. Eckhard Scholz. 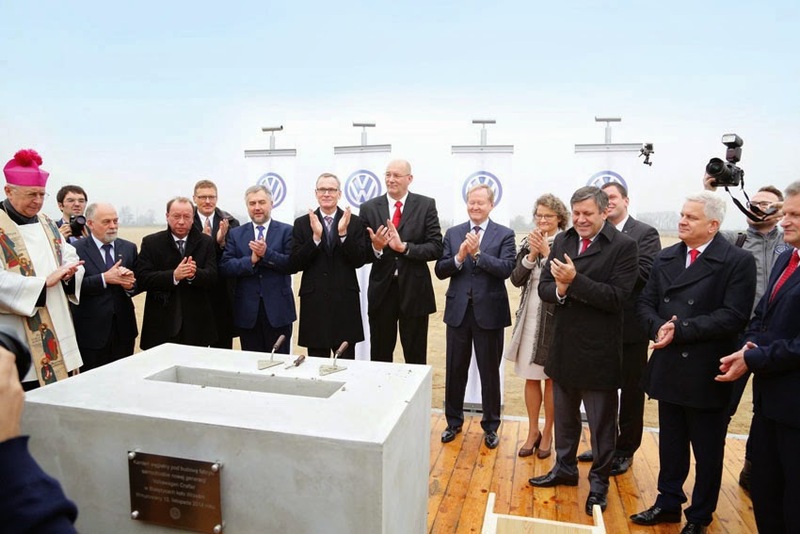 "This makes Volkswagen Poznań the second pillar for the brand - after the main assembly plant in Hannover. In future, this pillar will provide more support and therefore the foundation stone is laid today in the literal sense of the word. By a new plant and by a new vehicle, continued Scholz. The first VW Crafter vehicles will be delivered starting in the second half of 2016. It is planned to achieve an annual production capacity of up to 100,000 vehicles. A modern paint shop will be built on the plant site as well as halls for body assembly, vehicle assembly and a supplier park with logistics areas. Up to 3,000 employees will work in the new plant. Volkswagen's investment will also help automotive suppliers create new jobs. At present, the percentage of parts supplied to the VW plant in Poznan by Polish companies is over 40 per cent.